Winston Churchill served as Britain’s First Lord of the Admiralty during the early years of the First World War. Churchill and his role in the First World War is a worthy subject, and several Churchill biographers—Sir Martin Gilbert, William Manchester, Robert Rhodes James, Roy Jenkins, Paul Johnson and, of course, Churchill himself—have written brilliantly about it. Churchill’s greatest accomplishment during the war was readying the fleet upon which Britain’s survival ultimately depended. His greatest failure (though there was plenty of blame to go around) was the Dardanelles campaign, which cost Britain and the empire hundreds of thousands of casualties for no appreciable gains. John Harte, a former playwright and freelance writer who has previously written about Churchill’s role in the Second World War, has written a very uneven book about Churchill and the First World War. 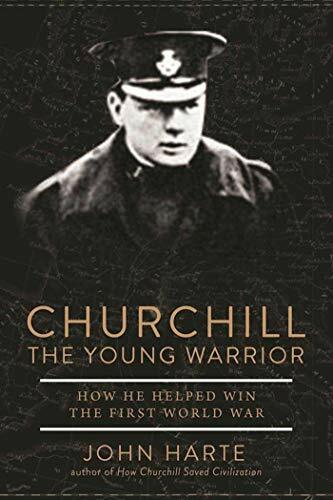 Harte spends more than half of Churchill the Young Warrior writing about certain aspects of Churchill’s childhood, school years, military education, his early military adventures in Cuba, India, and Africa, and his first decade as a member of Parliament. All too frequently, the author interrupts the flow of his uneven narrative with unnecessarily lengthy digressions, including discussions of Freudian psychology and Victorian mores, which serve to distract more than they inform. He portrays Churchill as a liberal social reformer who sought to use the power of the state to improve the lives of the poor and downtrodden; in effect a traitor to his class, like Franklin Delano Roosevelt in 1930s America. But Churchill did not view politics or the world through the lens of “class.” Instead, like Disraeli, he understood that the industrial revolution and unbridled capitalism needed some fine tuning that could only be accomplished by the state. In fact, at the end of his political career, Churchill was an outspoken opponent of socialism. Churchill in truth had no fixed political philosophy. He believed in the 19th century world order headed by the British Empire, the superiority of western civilization, and that he was destined to play an important role in defending the empire and that civilization. As war clouds gathered over Europe, Churchill became First Lord of the Admiralty and ensured that Britain maintained superiority at sea over its German rival. Harte emphasizes Churchill’s efforts to explore naval arms limitation with Germany, but the First Lord would never sacrifice Britain’s concrete naval advantages at the abstract altar of arms control. When war broke out among the great powers of Europe in August 1914, the British fleet was ready—ready to transport arms and men to France and Belgium; ready to block Germany’s access to the sea; ready to defend the British Isles. The armies on the Western front soon settled into the deadly stalemate of trench warfare. Churchill sought to use sea power to break the stalemate by forcing the Dardanelles Strait, defeat Ottoman forces on the Gallipoli Peninsula, and link-up with Britain’s Russian allies. As Harte notes, Churchill’s plan was sound in conception but bungled in execution. Churchill later devoted 15 chapters of The World Crisis, his multi-volume memoirs of the First World War, to explaining what went wrong, but he nevertheless received most of the blame for the costly failure. He was forced to resign from the Admiralty and actually served for several months as a soldier in the trenches on the Western front. Churchill’s other major contribution to Britain’s war effort was championing the development of the tank. As Harte notes, Churchill wanted to use tanks in much greater numbers to facilitate forward movements of the army, but other than a brief and limited success at the Battle of Cambrai, the tank’s full usefulness would not be demonstrated until the Second World War. Harte concludes his book abruptly by noting America’s involvement in the end of the war and discussing Churchill’s fondness for spies and espionage, and his distrust of the new Bolshevik regime in Russia. There is no effort to summarize or highlight Churchill’s contribution to the British war effort.